Do you enjoy the outside life? The Town Council has launched another campaign to encourage residents to visit Hailsham Country Park and enjoy the beauty of the spring season. 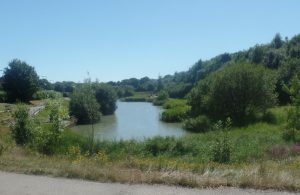 The Council-maintained Country Park, situated off Gleneagles Drive, covers approximately 22 acres and incorporates woodland, a recreational grass area, two ponds and a lake. A water course skirts the open field area and all-weather footpaths can be found throughout the park to encourage people of all ages to enjoy this precious open space area. “Offering a peaceful and relaxing environment and with so much to offer, the Country Park is an ideal place to get away from it all,” said Karen Giddings, Environment & Planning Officer at Hailsham Town Council. Hailsham Town Council is proud of its many improvements to the site in recent years, including the construction of a new path around Wentworth Pond and other area-specific projects. Furthermore, the park’s high level of maintenance by Town Council works staff, together with regular monitoring of the area by two Water Bailiffs, has ensured that the site remains a safe and clean public green space for the whole community to enjoy.